Milan has always been to me a city of heritage and exceptional craftsmanship. I mean, which fashion week does culture and luxury as well as MFW? Amongst all the labels showing at Milan Fashion Week however, Dolce & Gabbana has consistently been the one with the most tocco italiano. 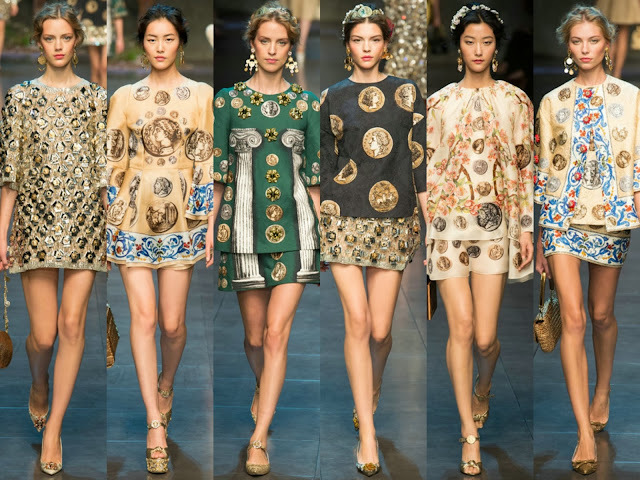 Ever since discovering the magic of Dolce & Gabbana during their F/W 2013 season, I have since been in love with their cheerful yet exquisitely-made collections. This season, the Italian duo served up yet another gorgeous collection inspired by their hometown of Sicily. Italy has clearly been an endless source of inspiration for their collections, considering that their past nine seasons were all inspired by it's culture and history. But what set the Spring 2014 collection apart was the very strong Greek theme it had. From white temple-like columns and ancient goddesses, to almond blossoms significant to Greek culture and oversized golden coins, these Greek motifs appeared on almost every part of the looks, from the accessories to the clothes. 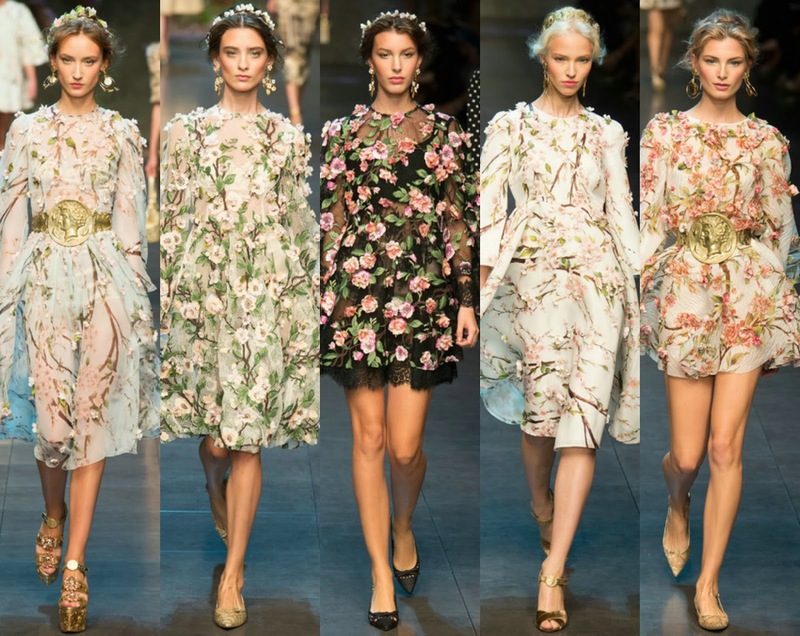 The Sicilian almond flower was a symbol of ancient pagans and this season, almond blossom trees were not only the backdrop of the runway venue, the blossoms were also adorned on the models' hair and appliquéd on the delicate long-sleeved semi-sheer organza frocks that floated down the runway. (I can just imagine Dolce girls wearing these to a picnic or a day out in a Mediterranean city!) As ethereal and dream-like as they were, the florals were not sewn on but actually hand-painted onto the gowns, clearly showing the amount of craftsmanship that goes into the pieces. 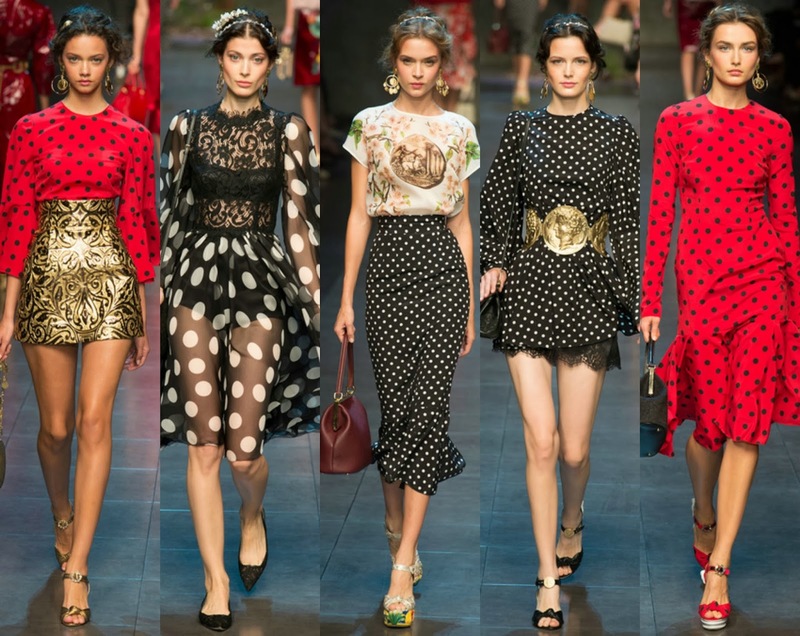 As trendsetting as always, Dolce & Gabbana showed a number of pieces with the polka dot, a trend that was revived during London Fashion Week. From sheer and lace gowns to bright red dresses and black pencil skirts, polka dots were given a fresh spin on the Dolce & Gabbana catwalk. Brace yourselves for a spotty wave throughout the fashion world! 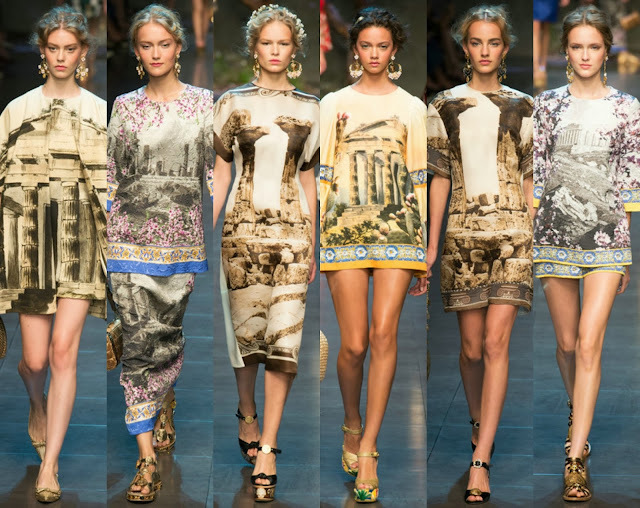 Dolce & Gabbana gave Greek history a fashion makeover with their prints of ancient ruins on dresses. Greek temple columns and crumbling Italian architecture were the prints of interest for the duo, as they splashed them on a variety of accessories, clothes and shoes. What caught my attention was the clever use of Greek columns as heels for one of the shoes, it was hands down the most unique and original shoe designs of Spring 2014. If you ask anyone what the most memorable part of the collection was, it would most likely be the phenomenal use of Roman and Greek coins. Exploding everywhere on the runway, the coins were at the centre of the gold gilded belts cinched on gowns and tops alike and dotted sheer LBDs, lacy shorts and outerwear. 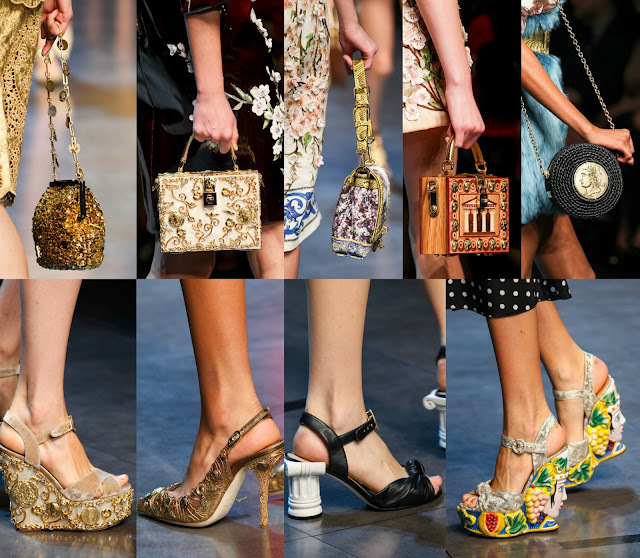 Accessories were also not spared the money makeover, with coins adorning heels, shaped into draping necklaces and attention-grabbing buckles on the bags. Even the models' 'do were stashed with coins! Domenico and Stefano were clearly working the "If you have it, flaunt it." style. Last season had gilded embellishments, this season had fur. Fur stoles took the runway by storm in a myriad of shades, from beige to deep green, to blue and cardinal red. The fur brought volume to the looks and turned the luxury of the collection up a notch. The soft/hard contrast between the hard gold accessories and the lush fur was another D&G signature and after so much eye-popping gold, the fur was just the right touch to round up the collection. In an ode to Sicilian glamour (and perhaps femininism), Dolce & Gabbana sent out what Twitter called the #GoldenArmy : an army of models wearing nothing but top-to-toe gold, strutting down the runway en mass for the finale. 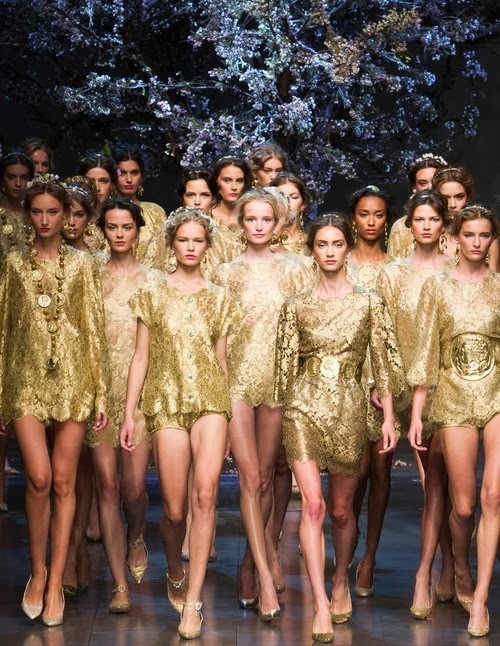 This was what the D&G princess was all about : being bold, fierce and glamorous at the same time. Fabulously italiano. love their prints so much!! those shoes and bags are brilliant! Their prints are just so cultured! charlotte, fourteen years young with a love for breathtaking photos and expensive things. eternally obsessed with everything glamorous, big cities and chanel.